We came together for two main reasons. First, we aimed to produce a new, comprehensive Youth Statement that represented our consensus on key issues in the ASEAN region. Second, we hoped to strengthen our youth network to facilitate communication and exchange of ideas, support youth activities and share information between youth working at the local-level. The ASEAN Youth Forum was co-organised by Thai Volunteer Service Foundation, ActionAid Thailand and Youth for Local Wisdom Network (Seubsan) and brought together 60 youth partcipants from 9 countries from Southeast Asia countries. We planned for the Youth Forum to be a platform to build recognition for youth voices in civil society and engage directly with ASEAN. Erwin, a student activist from Java, Indonesia pointed out early on, “youth are casualties of globalization.” This statement may seem vague, but it makes an important point. The economic, socio-cultural and environmental changes occurring in ASEAN are having real, negative impacts on youth and we are increasingly aware of them. Southeast Asian countries have young populations, yet there is little being done by state governments to support a sustainable future for the next generation. Whether it is unemployment in Indonesia or Cambodia, unequal access to education in Lao PDR or Burma, gender inequality in Vietnam, socio-political apathy in the Philippines or Singapore, and migrant labor throughout the Mekong sub-region, there are serious problems and challenges facing youth. Economies have expanded greatly and many youth own fancy cell phones and motorbikes, but what are we to for all ASEAN Youth? On our second evening, I sat for dinner with a Vietnamese environmental researcher of Khmer Krom heritage, a Lao youth organizer of Vietnamese decent, a brother and sister from the Tai Yai community in Shan State, Burma, and a Thai student activist from the rural northeast. We sat together, speaking Thai, Lao, Vietnamese, Tai Yai and English, while sharing ideas about important issues. Our conversation ranged from regional history of migration, the climate crisis and carbon trading, agribusiness and livestock feedlots, global economic bodies like the G8, BRIC and ASEAN, and finally, the construction of dams on the Mekong and Salween rivers. After dinner, it hit me that I was working with a unique group of young people that genuinely care about society and are working for positive change. But for many grassroots activists, ASEAN’s economic focus is a major problem. Some youth reject ASEAN on this principle, while others question the viability of bilateral trade agreements. To all of us, such an emphasis on the economy speaks to ASEAN’s ignorance towards important social and environmental issues. Yet how do we want to engage with an institution that we don’t agree with? There is an undeni- able value in actually meeting person-to-person, bringing people together for a common cause (though not necessarily a stress-free process). Our participants knew that we needed a clear, specific set of recommendations. We shared common ground on human rights, impacts from the financial crisis, human trafficking, government corruption, natural resource exploitation and environmental destruction. We also understood the potential for conflict between bordering nations, especially from the Mekong and Salween dams and the increasing presence of Chinese investors and corporations in natural resource-rich economies. The problems associated with the conventional education system are something many youth are already focusing on. Vietnam youth organizations such as the Vietnam Students Union are working to address this issue, but are unable to take a rights-based approach because of government intervention. Indonesian, Philippine and Malay youth organizations are all fighting against privatization of schools and pushing for youth participation in education system decision-making. Thai youth from the Youth for Local Wisdom Network called for reform in the conventional education system and made concrete suggestions about the need for alternative education, which includes and supports local communities. Though the Lao government seems convinced by the “battery of Southeast Asia” concept, Lao youth are able to articulate very clearly the connections between large-scale development projects, such as dams, and impacts on community and environment. Development in Laos has meant a widening gap between the wealthy and poor (especially in terms of education) and environmental destruction. Youth in other ASEAN countries (including those not direct beneficiaries of Mekong hydropower) saw this as an important issue and were supportive of a strong statement regarding the environment. Moving beyond our demands to stop large-scale hydropower development, we urge more support for local, renewable and community-managed forms of alternative energy. Given the dedication to human rights by the Thai Volunteer Service Foundation and ActionAid Thailand, the protection of human rights was a key issue for our forum. As one Burmese youth living in a refugee camp on the Mae Sot border pointed out, “we have our own rules and laws, but they are only in the books.” These youth were incredibly brave to stand in front of ASEAN and speak honestly about the Burmese people’s struggle. The unveiling of the AICHR at the 15th ASEAN Summit made clear that civil society’s interests were not taken into account, but we will continue this work for justice and community rights regardless of ASEAN support. The regional economy was a major sticking point for our group’s process. Donaldson Tan’s in-depth understanding of regional politics, economics and even engineering eventually became an essential part of our critical engagement with ASEAN. Several Thai grassroots activists were initially frustrated by Donald’s insistence about economic issues, such as the inevitability of free trade and Free Trade Agreements (FTAs). But through hours of exchange and debate, we forged common ground about the need for fair trade and intervention on corporate exploitation of workers and natural resources. We are believers in the power of local economies and the role of youth social entrepreneurs in those communities. This is where ASEAN should put its support if they truly want to strengthen the regional economy. When we first met each other, Che-Anne, a student activist from YPSEA in the Philippines, called our network’s goal, “greater collaboration for greater space.” Later, while introducing the Philippines’ situation to the group, she concluded that “participation is not just about airing grievances, we need to propose concrete solutions.” Based on our Youth Statement, it’s clear that we’ve proposed concrete solutions. But can we bring a network together? Can we call it an “ASEAN Youth Movement”? Our access and use of communication tools remains an obstacle in this process. At our Media Team meeting, Burmese youth explained that e-mail from several major providers is unavailable, and most importantly, they must be very careful with what they send and receive, and how public that information can become. Most youth working in rural communities have irregular access to e-mail. When we use these tools, we tend to prioritize our communication as well. How can we make contributing to aseanyouthmovement.org or informing friends about an upcoming event a priority? The English language also remains a point of some contention. For some Thai activists, English represents the loss of culture and local languages, and for Che-Anne, from the Philippines; the ability to speak English fluently is a legacy of her countries history of colonialism. Yet for others, learning English is an essential tool for communicating to a larger audience and accessing information for abroad. These differing understandings of English will be an important challenge for keeping our network connected. The forum’s facilitator, Aphatson Sombunwatthanakun (P’Ae), introduced concepts of a “transnational civil society” and “regional people’s movement” to our group. We’ve created a group of friends in nine out of ten ASEAN countries, but how do we generate a “space” for us to work together. On one level, this space requires further funding, so that we can host more forums and meetings to develop future collaborative projects. On another level, this space requires commitment from our Youth Forum’s participants. If youth are committed to further communication and coordination, and bring their friends and allies into the process, we can begin to open a space and engage the local with the transnational and regional levels. Many youth don’t expect that much from ASEAN. The failure of government leaders to participate in the ASEAN Peoples’ Forum was certainly disappointing, but not surprising. The rejection of civil society representatives in the Interface dialogue with ASEAN was just the icing on the cake. How can ASEAN claim to be “peoples’ centered” while refusing to dialog with the people themselves? Many youth have said, “This doesn’t just stop at the ASEAN Summit.” Our voices are coming from grassroots communities and pursue ASEAN as another space for exchange. There are important common issues between many ASEAN countries: incomplete or unequal educational systems, youth job insecurity, a widening gap between urban and rural youth, environmental and social impacts from large-scale development and chemical-intensive agriculture. At the end of her discussion on human rights and ASEAN, Dr. Sriprapha Petchmeesri, now a member of the ASEAN Inter-governmental Human Rights Commission (AICHR), told us all, “Being noisy is useful as well.” It is clear that we will need to keep making government leaders listen to us. We’ve developed a progressive agenda and taking action at the ASEAN Peoples’ Forum (APF) was a first step. 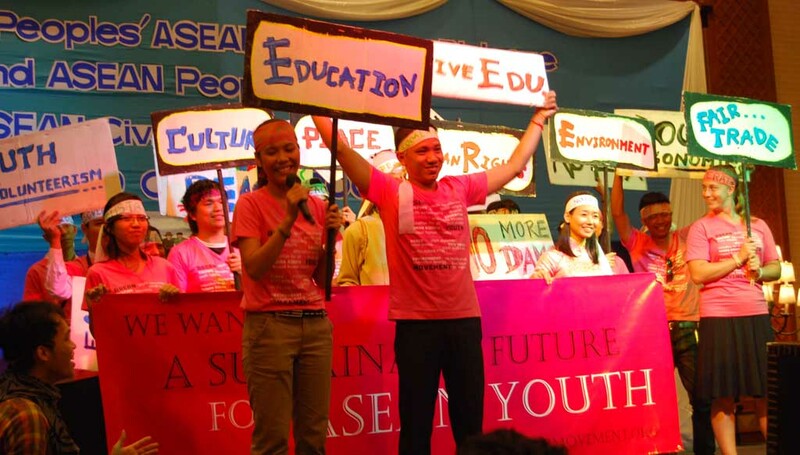 Running around the event in pink t-shirts and carrying signs that ranged from “Local Wisdom” to “NO EU-ASEAN FTA,” we made clear to the rest of civil society that youth are committed to working on regional issues. We believe that working for change ourselves is the most important. The Group of Eight (G8) – refers to France, Germany, Italy, Japan, Canada, the United Kingdom, Russia and the United States, finance ministers from these countries meet together annually in an informal forum to discuss global economic and political issues. The G8 will be replaced by the G-20 (the world’s 20 largest economies) this year. BRIC – refers to the economies of Brazil, Russia, India and China, they emcompass over 25% of the world’s land coverage and 40% of the world’s population. These countries have begun some political cooperation, but are not an official organization or alliance.